We'll look at both upperclassmen and underclassmen, analyzing players who are intriguing for the 2017 NBA Draft, as well as prospects who need more time to develop, but could be intriguing in the future. This week we break down Northeastern senior T.J. Williams, who plays in the Colonial League. Williams, who went to high school at Pflugerville in suburban Austin, Texas, has really burst on to the scene in his fourth and final year at Northeastern University. Williams was just another guy for the most part in his first three years at Northeastern, averaging 6.7 points and 2.8 assists as a junior. But with the departure of Quincy Ford and David Walker, he has taken over the keys to the Northeastern offense and exploded into one of the most productive guards in college basketball. 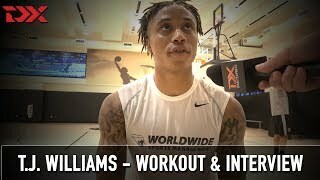 Moving to the point guard and taking over full-time ball-handling responsibilities has done Williams a world of good, allowing him showcase the ability to both score and create from that spot. He leads the Colonial Athletic Association in scoring at 21.5 points per game, but is also averaging 5.2 assists while shooting 56% from 2-point range and 38% from beyond the arc on 3.6 attempts per game. Williams certainly has room for growth in terms of continuing to fine-tune his point guard skills, as he struggles to turn the corner at times and will get his shot blocked a decent amount inside the paint against better competition. Maintaining a consistent defensive effort will be a major emphasis for him at the pro level, as he really struggles to guard in space and leaves a lot to be desired with his intensity level. Nevertheless, Williams has had a very impressive senior season and will undoubtedly get an invite to Portsmouth Invitational Tournament in April, where he'll be able to show that his productivity can translate against better athletes. He had a very good game in a win at UConn earlier this season, and helped his team to an impressive victory at Michigan State (where his numbers were down), but hasn't had too many opportunities to line up against elite-level competition otherwise. Northeastern is just 6-4 in the Colonial league and will need to wrestle away a NCAA bid from two very good teams in UNC Wilmington and College of Charleston in the Conference tournament.